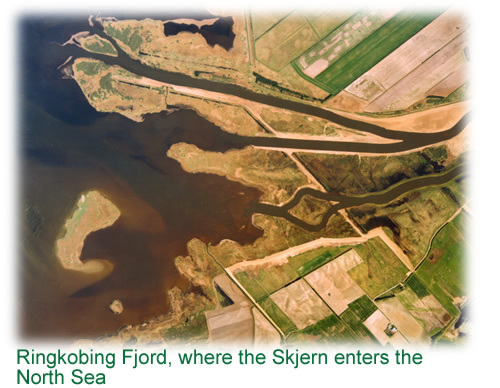 The Skjern is Denmark's largest river, draining over 10% of the mainland before discharging through the broad shallow Ringkobing Fjord to the North Sea. Less than 40 years ago the lower river catchment supported a rich mosaic of watercourses, lakes, ponds, reedbeds, meadows, common grazing land and heathlands. In times of flood, an enormous lake was formed, interrupted only by boggy marshlands. 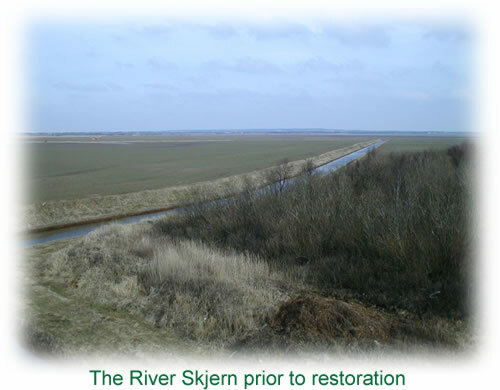 Between 1962-68 the river was straightened, deepened and embanked, and gradually the wetlands, meadows and heath were turned into a 4000ha, arable prairie. 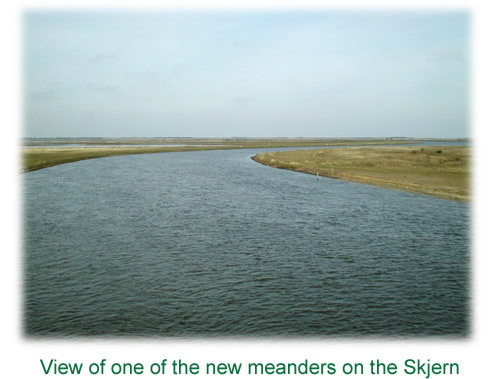 This was Denmark's largest drainage project, equating to around £22m today. However the gains for agriculture were not as easily sustained, as first thought. As floodwater no longer flowed over land, and as fertiliser was liberally applied, the floodplain began to act as a huge 'source' of nutrients, and was no longer a 'sink' for sediments. This had a disastrous impact on the fjord as it became silted up and polluted. Problems also arose in the drainage area itself. The land shrunk as it dried out, and so land levels dropped making drainage ineffective and water turned bright red due to ochre precipitation. Work is progressing to schedule with half already completed. 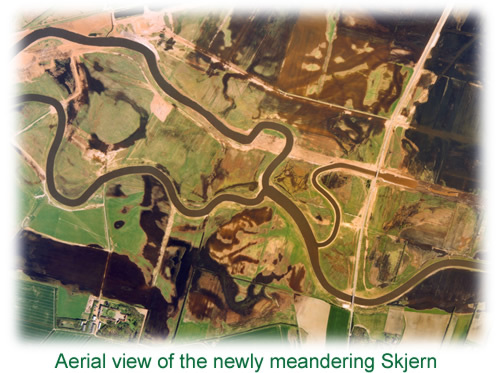 Much of the straightened and embanked section of the River Skjern no longer carry any flow, and have either been partially retained as linear ponds, or been in-filled with material that arose as new meandering channels had been constructed. Where less than three years ago there was not a puddle of water, vast winter lakes now appear as floodwater is again stored on the floodplain as the newly meandered river over-tops its banks. Almost £1.5m is being spent on monitoring the effects of the project on the quality of the fjord and the environments of the river and the floodplain.